« NEW LAUNCH! FULTON HOUSE Burnaby Brentwood Condos by Polygon! Amacon presents an exciting new presale condo opportunity for home buyers looking at the Brentwood Burnaby community! 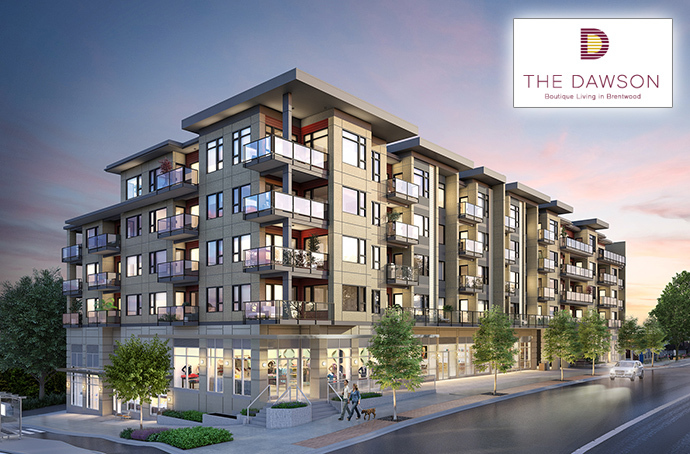 The Dawson features an intimate collection of only 62 homes located at the corner of Dawson Street and Willingdon Avenue Burnaby. Situated in the highly sought after and newly redeveloping Brentwood Town Centre neighbourhood, The Dawson Burnaby condos by Amacon feature affordable luxury and spacious 1, 2 and 3 bedroom homes (many with extra spacious outdoor living areas) plus over 10,000 square feet of private amenities. The homes will be ready for move in soon (Spring 2017). High end interior features are designed by False Creek Design Group and will include finishes of stainless steel appliances, quartz counters and wide plank floors in addition to the convenience of a walkable community that’s just steps away from the Brentwood SkyTrain Station, Brentwood Mall and a new Whole Foods Market. On-site will be an impressive array of building amenities that includes a fitness centre, social lounge, garden plots and a children’s play structure. 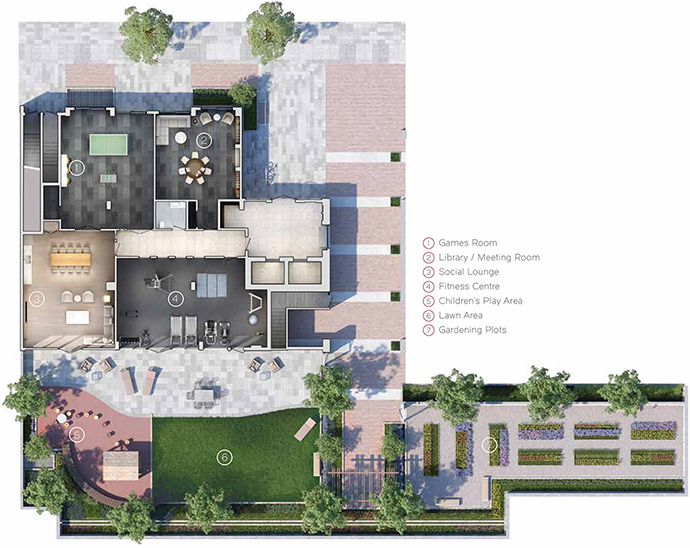 There’s also a meeting room/library, outdoor lawn and secured underground parking with bike storage. As with any Amacon condo project, the interior features are some of the best in the Vancouver real estate market place. 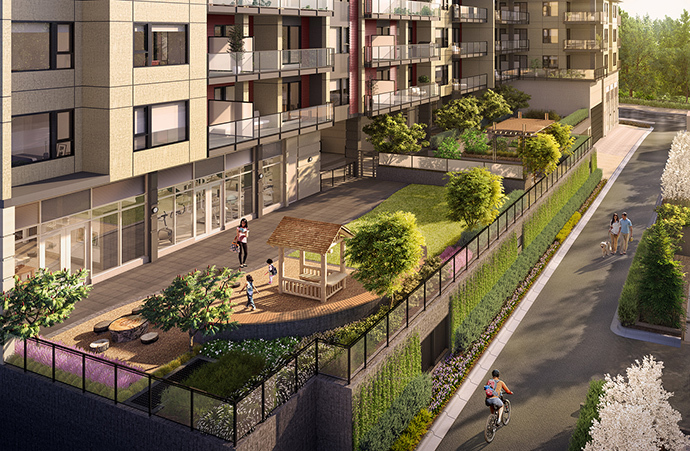 False Creek Design chose the interior palettes that homebuyers can choose from during the presale phase. The one, two and three bedroom homes will have airy 9 foot ceilings and spacious open floor plans for modern living. The two colour palettes include Scheme W and D, and the main living spaces and bedrooms feature wide plank laminate floors. All homes will have high efficiency washer and dryer (front loading) in addition to smooth finish ceilings and flat profile baseboards throughout. There are roller shades on all exterior windows for added privacy in addition to nine foot ceilings as mentioned above. The homes will feature double glazed low E windows, building recycling stations in debris rooms and low VOC paint everywhere. 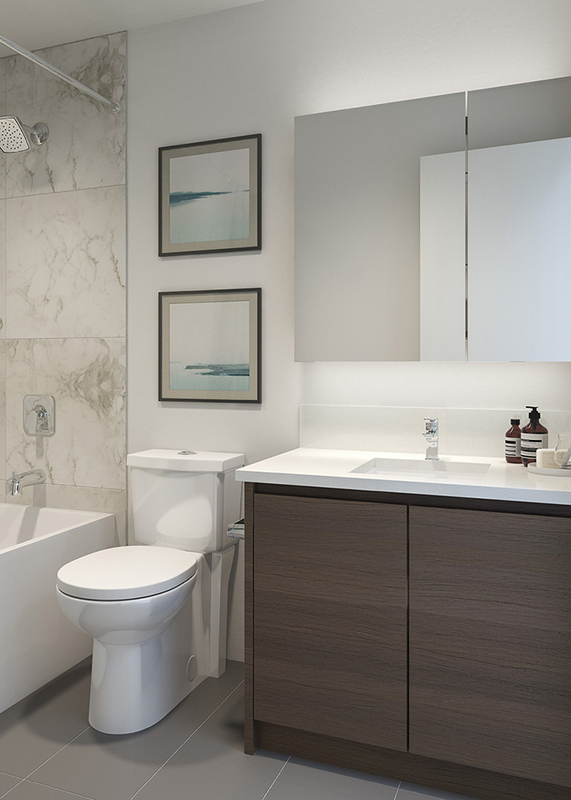 The bathrooms at The Dawson Brentwood condos for sale will feature custom vanity with clean square edge profile, polished stone counters, porcelain sink and Moen brand faucets and rain shower head in chrome finish. The bathrooms also have mirrored medicine cabinetry for added storage with recessed lighting. The kitchens at the presale Burnaby Dawson Brentwood condos include Moen chrome faucet with pull down spray, contemporary single basin undermount sink, soft close door and drawer mechanisms and under cabinetry lighting. The kitchens also have full height stone backsplash and polished stone counters featuring an overhang for extra counter seating in some floor plans in addition to smooth finish laminate cabinetry that’s modern and easy to clean. 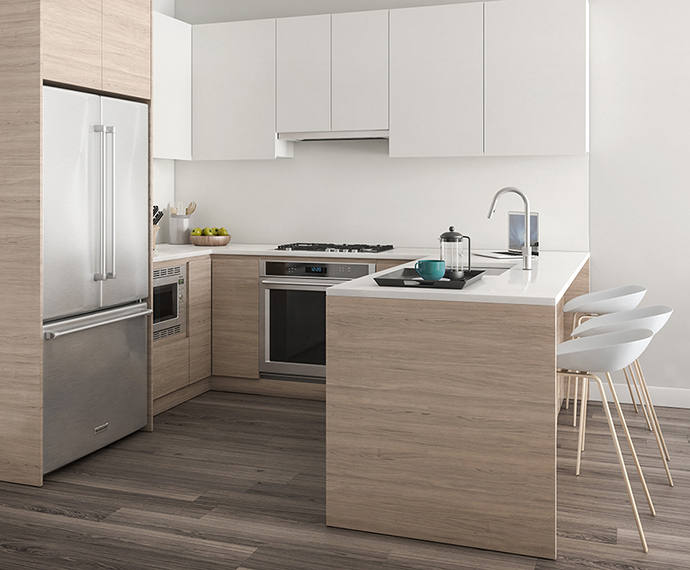 The appliance set at The Dawson by Amacon in Brentwood Burnaby real estate market features a stainless steel French door fridge with bottom mount freezer, microwave, build in glide out 300 CFM hood fan, multi-cycle dishwasher, convection wall oven and five burner gas cooktop. There are many spacious floor plans presented at The Dawson by Amacon, but the most exciting are the adaptable three bedroom layouts. Plan A at The Dawson features 3 bedrooms plus den and 2 full bathrooms at 1,119 square feet plus an outdoor space of 233-312 square feet. The Plan 3 3 bedroom plus den floor plan (not adaptable) is 1,166 square feet plus 598 square feet of outdoor living! The most number of layouts belong to the 2 bedroom and they are between 864 to 980 square feet. The 2 bed plus den floor plan features homes between 942 and 1083 square feet (the latter having a 646 square foot roof deck!). The affordable 1 bedroom Dawson Brentwood condos are between 594 to mid 600 square feet.